One of the most surprising facts about Ludwig van Beethoven is that he had a hearing loss. How can a musician, a composer, lack what we would imagine to be his most important sense? He did not begin to lose his hearing until around 1801. He suffered from tinnitus, a “roar” in his ears that he claimed made it hard for him to appreciate music, and he would avoid conversation. The cause of Beethoven’s hearing loss is unknown, but in history it has variously been attributed to lead poisoning, typhus, or even his habit of immersing his head in cold water to stay awake. Some of these are highly unlikely and certainly noise exposure would be very unlikely to cause a hearing loss of this severity. Over time, his hearing loss did become severe: there is a well-attested story that, at the premiere of his Ninth Symphony, he had to be turned round to see the tumultuous applause of the audience. He continued composing even as his hearing deteriorated. However, after a failed attempt in 1811 to perform his own “Emperor” Concerto, he never performed in public again. 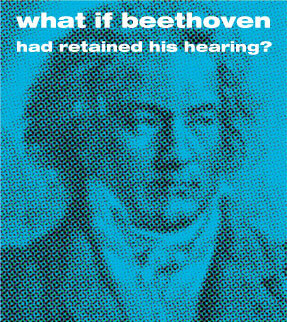 Hearing is important for all musicians, including Beethoven, which is why protecting your hearing is vital. Specialist musicians hearing protection is now the perfect solution used by thousands of musicians and performers worldwide. If you’d like to find out about musicians’ ear plugs or tinnitus treatment with one of our hearing therapists, please call 020 7486 1053 or complete below.